It's bad policy to speculate on what you'll do if a plan fails, when you're trying to make a plan work. Condoleezza Rice (born November 14, 1954) is an American political scientist and diplomat. She served as the 66th United States Secretary of State in the administration of President George W. Bush. Rice was President Bush's National Security Advisor during his first term, making her the first woman to serve in that position. Before joining the Bush administration, she was a professor of political science at Stanford University where she served as Provost from 1993 to 1999. CNN Late Edition With Wolf Blitzer, July 29, 2001. Interview by Wolf Blitzer on CNN, September 24, 2001. Press conference, May 16, 2002. This is your baby. Go do it. Regarding directives to the CIA on which torture techniques should be used. Summer 2002  . Washington Post, April 13, 2003. CBS News, November 28, 2003. 60 Minutes, March 28, 2004.
opening statement to 9/11 Commission, May 19, 2004. Condoleezza Rice: But I don’t remember the al‐Qaeda cells as being something that we were told we needed to do something about. testimony before the 9/11 Commission, describing the August 6 PDB, May 19, 2004. Advice given to her protégée, Kiron Skinner, while serving as Provost at Stanford University; quoted in James Mann, Rise of the Vulcans (Penguin Books, New York: 2004, ISBN 0-143-03489-8, p. 227. The United States doesn't and can't condone torture. And I want to make very clear that that's the view and the policy of the administration, the policy of the president, and that he's made very clear to American personnel that we will not condone torture....Senator, under no circumstances should we or have we condoned torture. And the president has been very clear that he expects everyone to live up to our international obligations and to American law. Secretary of State confirmation hearing, January 18, 2005. Secretary of State confirmation hearing, January 19, 2005. You see, this war came to us, not the other way around. Remarks at the U.S. embassy in Baghdad, Iraq, May 15, 2005. FOX News Sunday, June 19, 2005. Senate Foreign Relations Committee Hearing On U.S Foreign Policy in Iraq, October 19, 2005. News conference in Ottawa, Canada, October 26, 2005. Well, that's not how I read the statement … After all, do Iraqis really want to -- any Iraqi, sitting around that table, want to suggest that killing an innocent Iraqi child standing at a bus stop is legitimate? Or that killing Iraqi soldiers who are lining up at recruitment centers is legitimate? Or even that multinational forces -- who by the way are there under a UN mandate -- are somehow legitimate targets? Interview on CNN with John King, November 22, 2005. In response to the allegation that the U.S. has operated secret CIA prisons in Eastern Europe, December 5, 2005. Interview on ABC Good Morning America, December 16, 2005. Sometimes people decide to write reports even though they haven't been to Guantanamo. And so I would just suggest that people look at some of the work that's been done by people who have been there. But that's not to say that we will not be very glad at the day that conditions permit the closure of Guantanamo and the trying of its inhabitants or for their release. Remarks With British Foreign Secretary Jack Straw At Blackburn Town Hall, April 1, 2006. You are a good friend and we welcome you. [http://web.archive.org/web/20060413191309/http://www.state.gov/secretary/rm/2006/64434.htm Remarks With Equatorial Guinean President Teodoro Obiang Nguema Mbasogol April 12, 2006. Interview on Fox News Sunday, June 4, 2006. Remarks With Afghan President Hamid Karzai After Their Meeting, June 28, 2006. Interview on ABC This Week, July 16, 2006. Press Briefing, August 6, 2006. Interview by Anne Gearan of the Associated Press, December 21, 2006. Testimony before the Senate Foreign Relations Committee, January 11, 2007. My Fox guys, I love every single one of them. Comments overheard on an open microphone between morning television interviews, January 11, 2007. State Department annual budget request, Foreign Affairs Committee, February 2, 2007. Congressional hearing, February 7, 2007. ...the consolidation of a stable and democratic Iraq after the overthrow of Saddam Hussein is a part of what America owes to the Iraqi people, owes to the region, and owes to ourselves so that our own security is there. Chris, it would be like saying that after Adolf Hitler was overthrown, we needed to change then the resolution that allowed the United States to do that so that we could deal with creating a stable environment in Europe after he was overthrown. Interview on Fox News Sunday, February 25, 2007. 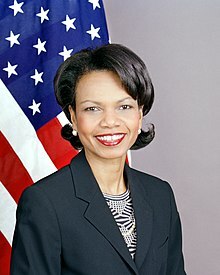 Condoleezza Rice: I think that these historical circumstances require a very detailed and sober look from historians and what we've encouraged the Turks and the Armenians to do is to have joint historical commissions that can look at this, to have efforts to examine their past and, in examining their past, to get over their past. Adam Schiff: ...you come out of academia... is there any reputable historian you're aware of that takes issue with the fact that the murder of 1.5 million Armenians constituted genocide? Adam Schiff: ...Why is it only this genocide? Is it because Turkey is a strong ally? Is that an ethical and moral reason to ignore the murder of 1.5 million people? Why is it we don't say, "Let's relegate the Holocaust to historians" or "relegate the Cambodian genocide or Rwandan genocide ?" Why is it only this genocide that we should let the Turks acknowledge or not acknowledge? Adam Schiff: ...You recognize more than anyone, as a diplomat, the power of words. And I'm sure you supported the recognition of genocide in Darfur, not calling it tragedy, not calling it atrocity, not calling it anything else, but the power and significance of calling it genocide. Why is that less important in the case of the Armenian genocide? Adam Schiff: ...Iran hosts conferences of historians on the Holocaust. I don't think we want to get in the business of encouraging conferences of historians on the undeniable facts of the Armenian genocide. Appropriations hearing before the Subcommittee on State, Foreign Operations, and Related Programs, March 21, 2007. I'm very glad that there was, in fact, a consequence. I think that this kind of coarse language doesn't belong anywhere in reasonable dialogue between reasonable people. … It gets ruined by this disgusting -- and I'll use the word 'disgusting' -- comment which doesn't belong in any polite company and certainly doesn't belong on any radio station that I would listen to. Interview by Michael Medved, April 13, 2007. Now, six years ago, al-Qaeda was planning to attack the Twin Towers. It wasn't a very nice world. And I think that if you think about six years ago, al-Qaida was preparing to attack the Twin Towers, Pakistan was allied with the Taliban, Afghanistan was the base from which al-Qaida was going to operate; the Israelis and the Palestinians had given up on a chance for -- or let me put it, the Palestinians had walked away from a chance for a Palestinian state, launched the second intifada, elected Ariel Sharon who basically said there would never be a Palestinian state and there will be a greater Israel; the North Korean were cheating on a deal that they had just signed; China and others were indifferent to that because it was a U.S.-North Korea bilateral deal; Iran was cheating on the IAEA out of sight. I could go on and on and on. That was the world in 2000 and 2001. And there is no doubt that by confronting -- oh, by the way, and Saddam Hussein was shooting at our pilots regularly in the no-fly zone and making a mockery of the Oil-for-Peace -- Oil-for-Food program and corruption was running rampant in that program. So, a worse world? I think so. Interview With the Associated Press Editorial Board, June 8, 2007. Interview by Maria Bartiromo in Business Week, 23 July, 2007. US Department of State, September 28, 2007. Lee, Matthew (13 October 2007). "Rice worried by Putin's broad powers". ABC News. Retrieved on 2007-10-14. .
Congressional hearing, February 13, 2008. ...I am proud of the decision of this Administration to overthrow Saddam Hussein. I am proud of the liberation of 25 million Iraqis. And I’m proud to see an Iraq that is now emerging with a stronger government, a truly multiethnic, multi-sectarian government that’s about to have its second set of elections, that’s inviting private investment into Iraq, and that is making peace with its Arab neighbors. Interview With Judy Woodruff of Bloomberg TV, July 1, 2008. Press briefing, August 13, 2008. In terms of the enhanced interrogation and so forth, anything that was legal and was going to make this country safer, the president wanted to do. Nothing that was illegal. And nothing that was going to make the country less safe. Unless you were there, in a position of responsibility after September 11th, you cannot possibly imagine the dilemmas that you faced in trying to protect Americans. You were determined to do anything that you could that was legal to prevent that from happening again... We were told, nothing that violates our obligations under the Convention Against Torture. And so, by definition, if it was authorized by the president, it did not violate our obligations under the Conventions Against Torture. Quoted in Glenn Kessler, "Rice Defends Enhanced Interrogations," Washington Post (2009-04-30). In response to a question about what "keeps her up at night", I worry about the fact that in K-12 education I can look at your zip code and tell whether or not you're going to get a good education. Interview by Donna Shalala C-Span Video Library No Higher Honor University of Miami, School of Business Administration, November 3, 2011. Hugo Chávez, January 11, 2007 . Yes, Leezza, Leezza, Leezza... I love her very much. Muammar Gaddafi, as quoted in Al-Jazeera (2007). ...the idea that she belongs in front of a war tribunal is not something I can dignify with a response. Miss Rice presides over a wide range of choices, a wide range of policies. She's handled that vast duty with dignity, with honor. Marc Landy, May 10, 2006 . Rice remained pretty embarrassed – in the end she didn't end up voting in favor of a resolution she organized. Ehud Olmert, January 12, 2009  . Condoleezza Rice serves an administration that has trashed the basic values of academia: reason, science, expertise, and honesty. Stanford should not welcome her back. Don Ornstein, May 31, 2007 . Wiam Wahhab, November 7, 2007 . This page was last edited on 9 December 2018, at 00:12.